Chatham, Mass – Daddio and I decided to celebrate our 18th wedding anniversary on Cape Cod, which is something we used to like to do BT. Unfortunately, we couldn’t get a babysitter. So, we made a rash and questionable decision to bring the twins with us. So…we spent the weekend a little differently than we might have otherwise. But we still ate tons of seafood. We still flew a kite on the beach. And we still watched the sunrise, which is our anniversary tradition. We also took a wildlife boat tour to the Monomoy National Wildlife Refuge, which is something I have always wanted to do. This is a 7600-acre uninhabited island that lies off the elbow of Cape Cod. It’s covered with marshes, dunes, ponds, and ocean, so the area fluctuates dramatically between high and low tide. It was established as a refuge for some 300 species of sea birds and shorebirds, but the star attraction now is the hundreds of grey and harbor seals. Initially, the twins were disinterested. 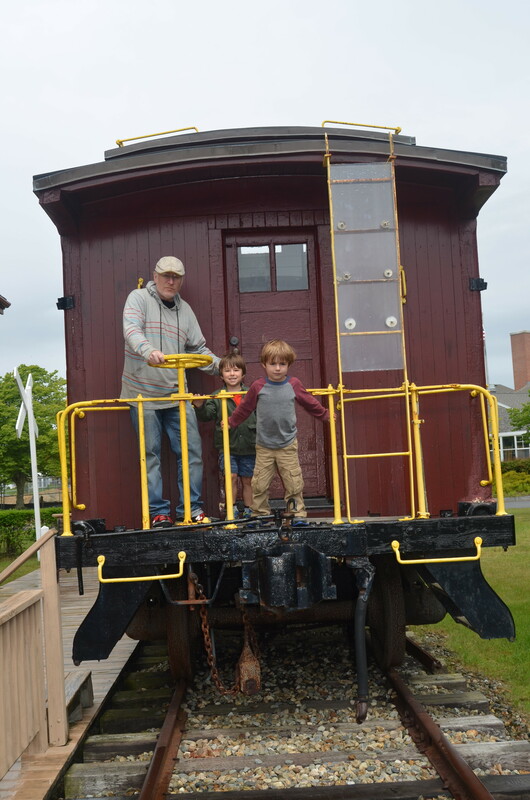 It was fun to be on a boat, but the tour got a slow start, tooling around the harbors of Harwichport before going out to the island. When we finally started spotting seals, they were just little heads that would appear momentarily on the surface of the water, then disappear before you could get a good look at them. But then we started spotting more and more, and the twins were spotting them too. Then suddenly somebody looked ahead and noticed that the long narrow beach was packed with seals lying on top of each other, like anchovies in a tin. Everyone on the boat was amazed by the sheer numbers of bodies. The twins were thrilled, as we watched hundreds of them play in the surf, waddle on the sand and lounge in the sun. Actually, hundreds might be low-balling it. (Twin S estimated a hundred million.) There were seals piled up on the beach. There were seals bobbing around in the surf. 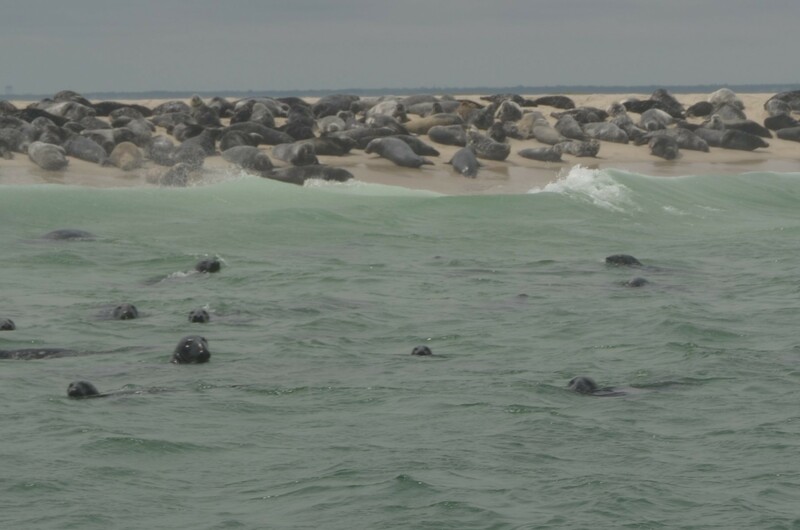 Sometimes, the captain reported, there are seals on the beach for as far as the eye can see. Pretty amazing–though not appreciated by the local fishing community! 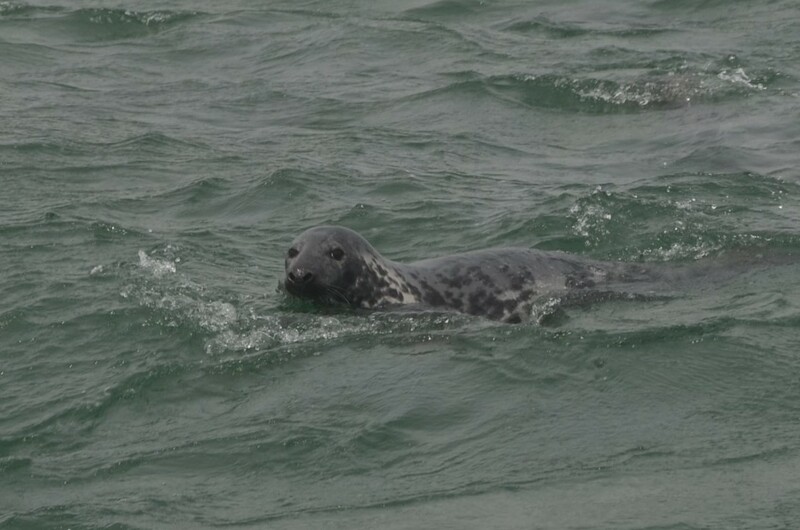 Incidentally, it is the seals that have started attracting the great white sharks in recent years. 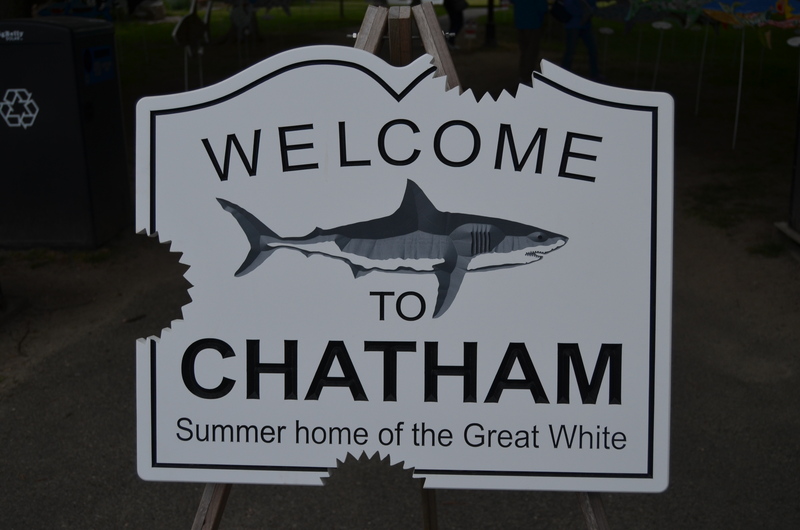 The town of Chatham has embraced this turn of events, as evidenced by the current Sharks in the Park exhibit in Kate Gould Park and the new Chatham Shark Center in the works. So the seals devour the fish; the sharks devour the seals; and the humans find a way to get in on it. Such is the cycle of life.